Portable fire pits can be accommodated by spaces large and small, and don’t require the commitment of a permanent feature. Plus, they are commonly available at home improvement stores and other retailers, often for under $75. We love how the portable fire pit allows this front courtyard to transition from sunny summer afternoons to chilly fall evenings. 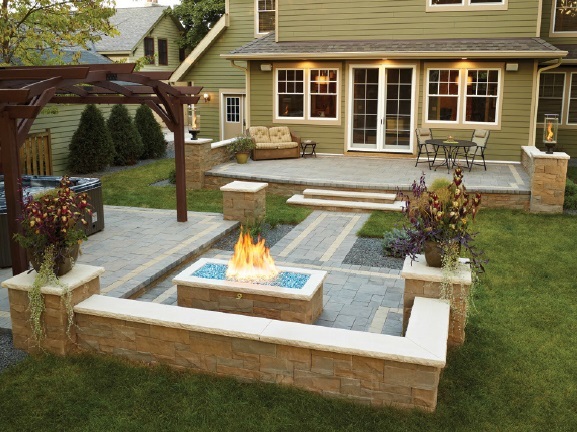 For homeowners who are dedicated to having a fire feature as a built-in landscape element, permanent fire pits provide function and allow creativity. 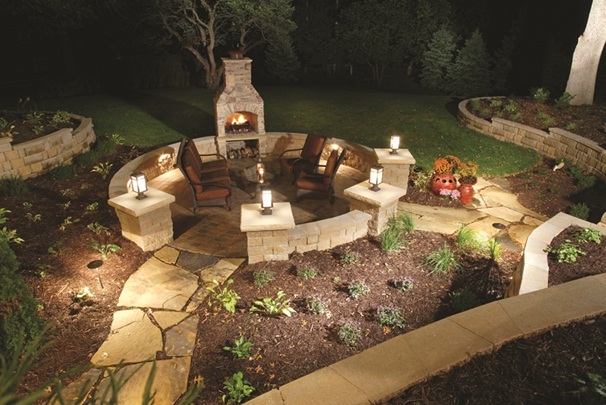 Permanent fire pits can be placed in-ground or above-ground, and can be created in circle, square/rectangle and other shapes to complement their surroundings. Some require professional installation, while others come in do-it-yourself fire pit kits. The Brisa® wall system fire pit and seating wall in this backyard create a cozy post-hot-tub gathering spot and offer a beautiful view from the raised patio. If you’re looking for a fire feature that truly sets the stage for entertaining family and friends (or curling up with a good book), look no further than the outdoor fireplace. 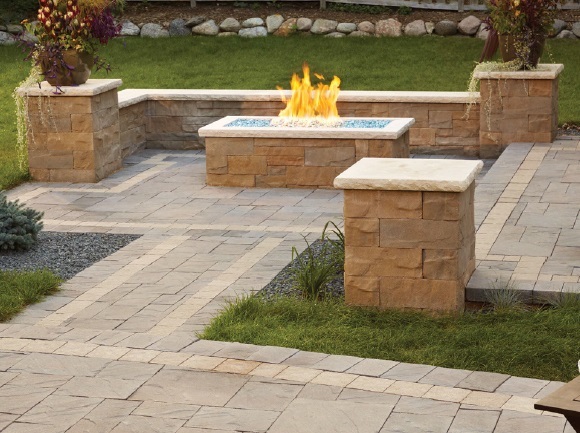 Outdoor fireplaces offer a variety of veneer options, including brick, pavers and even natural stone. 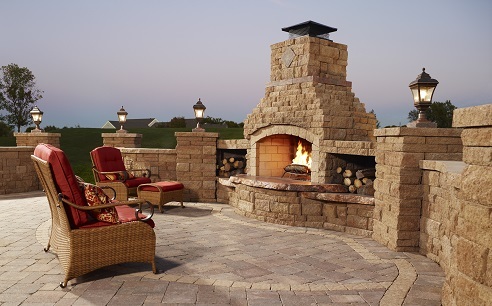 This means your outdoor fireplace kit can be customized to fit your desired style, and will instantly transform your backyard into the ultimate getaway. Be sure to let us know which fire feature is your favorite in the comments section below. And if you’re planning to add a fire pit or fireplace to your home’s landscape this season, check out our 5 Tips for Planning a Fire Pit to get started. Top Landscaping Trends: Which is Right for You? Summer’s almost here! The season’s short but there’s plenty of time to improve your landscape. Here are the top outdoor trends to incorporate into your yard. An outdoor living space, such as a kitchen or entertaining space, was cited as the most popular outdoor design element by landscape architects surveyed by the American Society of Landscape Architects. Landscape trends come and go, but well-designed gardens are always in style. What’s new for gardens? The rising popularity of native, drought-tolerant plants and using perennial plants for a low-maintenance landscape. Cities and citizens alike are looking for ways to reduce water runoff into ecosystems. Installing permeable pavers is an effective and stylish way to drain water into the ground. 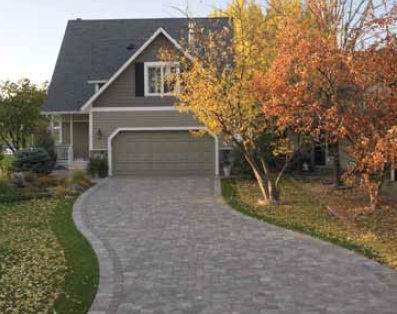 In addition to reducing runoff, permeable pavers naturally filter contaminants. Fire pits and fireplaces are very in-demand, according to 97% of the residential architects who participated in the ASLA survey. Fire elements remain popular because of the wide range of versatile products available. Homeowners can choose do-it-yourself fire pit kits or larger fireplaces that make stylish, dramatic additions to the yard. Which of these trends would you choose to enhance your landscape? Share your ideas with us in the comments section or on Facebook, or visit us at www.anchorblock.com for more outdoor living inspiration. 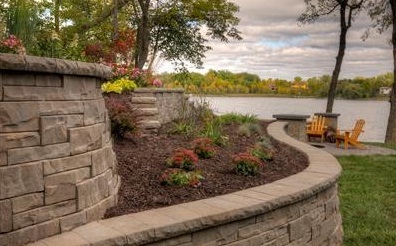 There’s plenty of great weather remaining in the Upper Midwest to complete and enjoy new landscaping projects. As you pack away the beach towels and wave to the school buses, consider these fall landscaping possibilities. Increase your home’s curb appeal in big and small ways. Start small by planting new perennials and adding seasonal, cool-weather plants like mums and pansies to transition your outdoor décor from summer to fall. Check out online resources for inspiration, like HGTV.com, which offers photos and ideas to inspire front yard creativity. 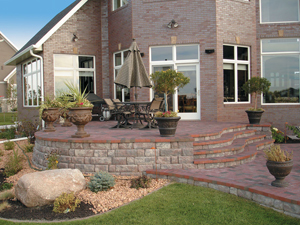 Hardscape products like pavers, columns and freestanding wall systems are a permanent way to make a great first impression. 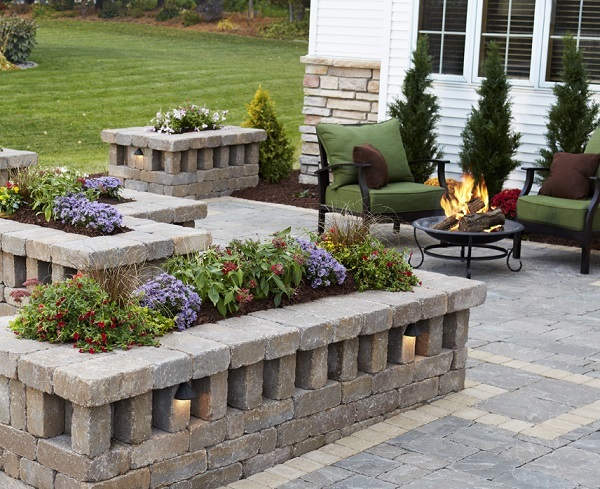 Front yard courtyards are great for seating and can be made using the Brisa® multipiece freestanding and retaining wall systems. Adding creative accents like columns, lighting, and coordinating pottery for annual plants pulls the space together for a unified look. Concrete paving systems are a durable, long-lasting way to improve a patio, driveway or walkway. Pavers are available in a variety of colors, textures and shapes, and many systems offer multiple sizes to create patterns. Concrete pavers are manufactured to meet strength and durability requirements so they stand up well in harsh winter climates. For easy do-it-yourself paver installation instructions, visit Better Homes & Gardens. 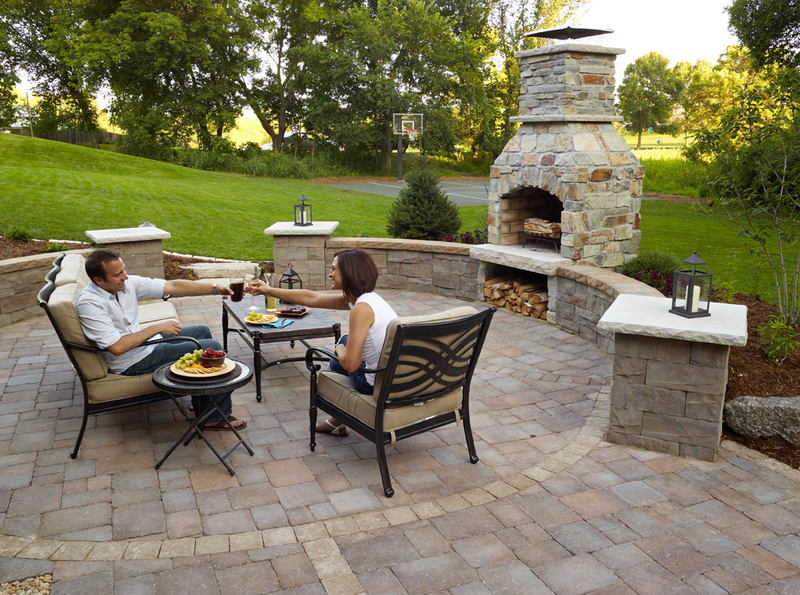 There’s no better way to extend the use of your outdoor space beyond summer than with a fireplace. There are many styles and sizes available to warm up cool fall nights. Stone Age fireplaces are modular kits that can be customized by size, shape, and choice of veneer options, including brick, pavers or natural stone. Fireplaces can be freestanding or integrated into a seating wall, with options such as storage space for wood or decorative mantles. Every yard has a troublesome feature that stands between you and enjoyment. Here are some creative, attractive solutions to common landscaping challenges. 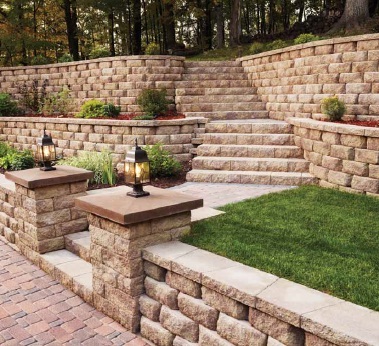 Change a hard-to-mow slope into a garden by installing terraced retaining walls. Add stairs to improve accessibility to all areas of the yard. In low-lying areas, water pooling from poor drainage can make the space unusable. 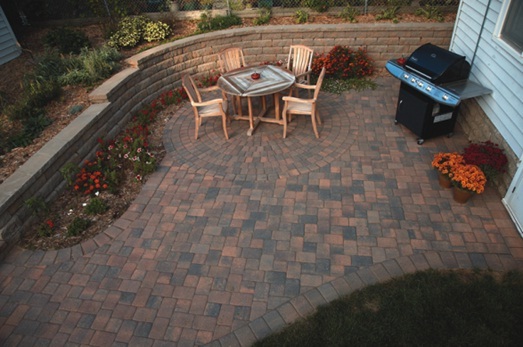 Take back the space and make it beautiful by installing pavers and retaining wall systems. Consider consulting a contractor or a landscape supply dealer to design and install a good drainage system. Replace a worn or unattractive wooden deck with a raised patio and benefit from low-maintenance and extend your living area into the backyard. There’s plenty of warm weather left to realize your landscaping dreams. For more information and to view our catalog, visit our website at www.anchorblock.com. Whatever inspiration you find to make your landscape dreams come true, click over to our Facebook page and tell us about your favorite projects.